This super-crag is situated eastward from the little village of Sv. 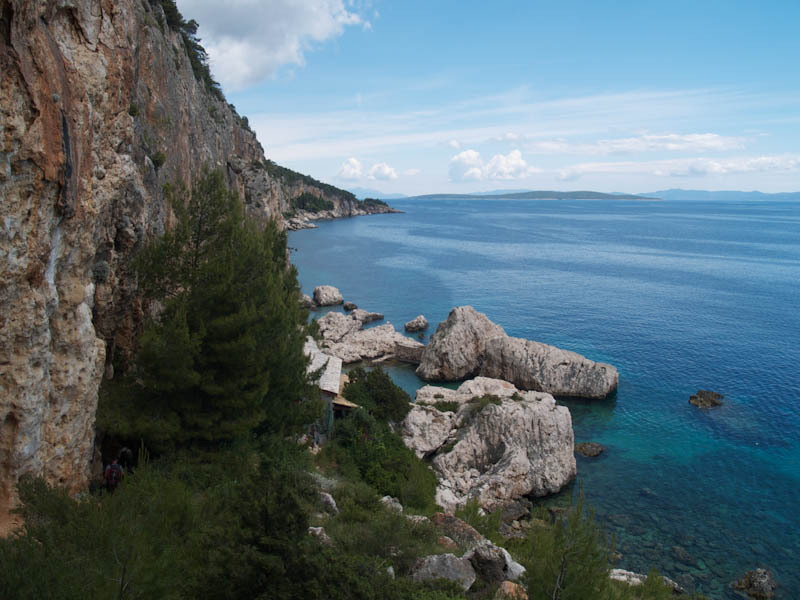 Nedjelja on the south side of the island and is the place to be for all around climbing and enjoying. The crag is sometimes called Sv. Nedjelja, sometimes Šuplja Stina and sometimes Cliffbase, the latter being the name given to the crag by its owner (see cliffbase.com). This is the most popular climbing spot on the island and for good reasons. You will find easy and hard routes, DWS, DWS boulder traversing and stunning nature. Climbing – Easy, moderate and hard. Frequently longer routes. Lot’s of DWS. Equipment – Sport climbing equipment, up to 80m rope, up to 25 quickdraws. Routes sometimes have two pitches, take abseiling equipment. There is just one official road going to Sv. Nedjelja and it starts from Jelsa towards Pitve, then through a one-way tunnel towards Zavala and Ivan Dolac. Once you are out of the tunnel, just go right down the coastline until you reach Sv. Nedjelja. In the village, turn left towards the sea and park at the sea front. Other possible road to Sv. Nedjelja – be careful (!! ): If you are staying in the town of Hvar or other small places on the south west of the island, you may venture and take a non-asphalt road towards Sv. Nedjelja, going right just before the tunnel between Hvar and Starigrad. This will save you some 40km of driving, but will surely pump adrenaline into you as you drive near the vertical falling cliffs on a macadam road. Take this “road” only on your own responsibility and ask the locals about the current conditions. Important note: the only legal way to reach the crag from Sv. Nedjelja harbor is by sea, so you can either take a boat from the harbor or walk down the coastline to the east from the harbor for 0,7Km. Please contact the owner of the crag, Mr. Miro and ask for further info. You will find contacting details at the bottom. This crag is facing south and is at the sea level. Best seasons for climbing are winter, autumn and spring. In the summer, people enjoy the endless DWS lines or just being lazy at the beach until around 5PM when the sun goes over the cliff. There are some routes in the shadow even during the day though. Admission to Cliffbase is limited and by reservation only. By arranging your accommodation through cliffbase@cliffbase.com you automatically reserve space at Cliffbase for you and your entire party, and receive a 50% discount on your entrance ticket.